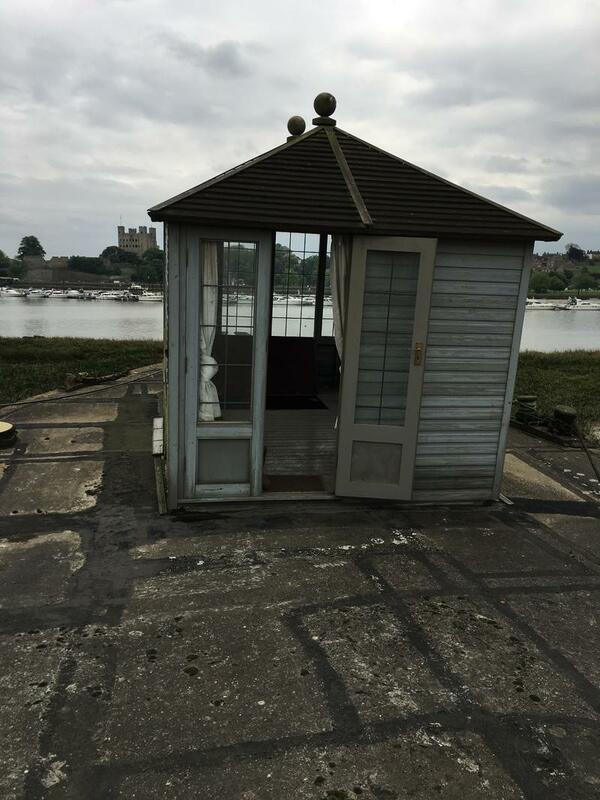 Premier Houseboats are pleased to present Blue sands, a converted concrete barge offering excellent space both internally and externally, and superb views across the river Medway to Rochester castle. Blue Sands offers good living space, with the potential to create more using the large open deck, and make the most of the stunning views. Entrance is through a small deck house towards the front of the boat, with stairs leading down into the kitchen area. this area has gas oven and hob, and a fridge freezer, together with lots of storage and work surface. A doorway leads to the main lounge, which is a fantastic size and also houses a dining table, and the log burning stove acts as a wonderful focal point to bring this area together. A wide hallway, large enough to house an office/computer area, leads down the side of the boat. There are three bedrooms, two double and a single, and at the end of the boat is a family bathroom with bath, toilet and hand basin. There are plenty of single glazed windows throughout the boat ensuring plenty of light, and there is full central heating with a gas combi boiler, that can also be used via the log burner. Blue sands needs some refurbishment inside, but is completely liveable whilst any work is being done. The hull, being concrete, means there is little or no ongoing maintenance. Overall, the space and potential offered is impressive, and with the outstanding views, this really is an amazing and affordable opportunity to create a wonderful family home. Vessel name: Blue Sands Vessel condition: Fair Year constructed: 1943 Berths: 6 Cabins: 3 Heads: 1 Length over all: 85' Beam: 22' Maximum draft: 4' Hull material: Other Hull type: Flat Hull colour: grey Disclaimer Premier Houseboats offers the details of this advert in good faith as it was presented by the seller or his representative but cannot guarantee or warrant the accuracy of this information nor warrant the condition of the described item within this advert. A buyer should instruct his agents, or his surveyors, to investigate such details as the buyer desires validated. The Item described within this advert is offered subject to prior sale, price change, or withdrawal without notice.